It is Oscars night, but I found a film to watch this afternoon was decidedly not an Oscar film. It was still quite an enjoyable experience. 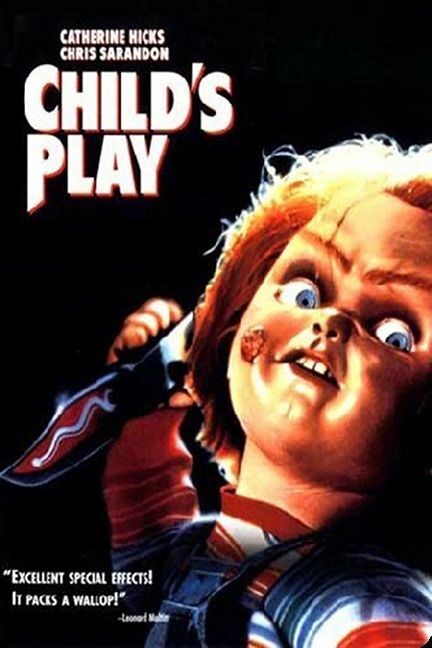 I see that there is a remake of this film coming out in September of this year so it is time for me to finally see the film Child’s Play, with the slasher doll, Chuckie. Right off the bat, there was Prince Humperdinck from The Princess Bride, Chris Sarandon as the lead detective. I know he is the greatest tracker in the land, he can track a falcon on a cloudy day… but I did not know he was here to take on a doll. Serial killer Charles Lee Ray (Brad Dourif) was being chased by Sarandon, whose character here is named Mike Norris. After being gunned down in a toy store, Charles Lee transferred his consciousness into a nearby Good Guy doll, and thus Chuckie was born. The doll wound up in the possession of Karen Barclay (Catherine Hicks) who gave it to her son Andy (Alex Vincent) for his birthday. When terrible things begin to happen, Andy gets blamed for them and taken to a psychiatric hospital, leaving the living doll a chance to wander around dulling out retribution. I have to say, I had just a little bit of trouble with the doll as the killer. While everything was sufficiently creepy and moody, I could not get it out of my head that he was a doll. Just tear off is head. Then, the head did come off and it did not stop Chuckie. Ha, who knew? I kept thinking that they needed to take a trip to the wood chipper. Chuckie showed himself very resilient throughout the movie, taking on the much larger humans, but he was always more dangerous, in my mind, when he was messing with Alex. I have a hard time buying that Detective Humperdinck couldn’t have just tore the doll apart. The special effects were outstanding, especially for 1988 and the story was simple. The whole transfer between bodies was weird and came from out of nowhere, but they did circle back around later to address why Charles Lee could do this. The movie was a good time and I enjoyed watching it, despite my needing to suspend my disbelief more than usual. I’m looking forward to the new version in Spetember.